plastic coils manufacturers, in-house spiral binding equipment, Plastikoil, 1 (800) 665-7884. 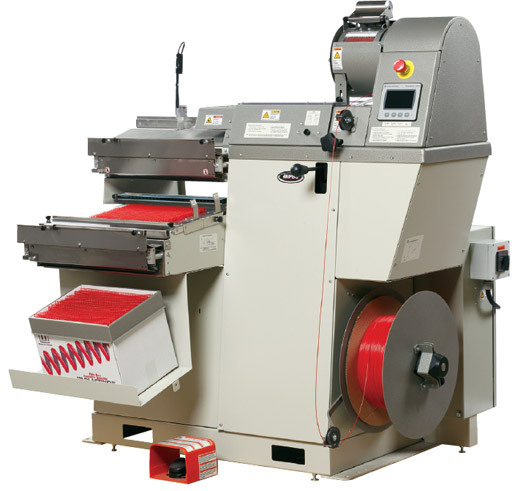 Plastic coil book binding systems. Outside North America call 1 (204) 663-9214. An electrical system complete with breakers. No replacement fuses needed. Empty Spool Detection system – allows for easier and quicker spool changes. Improved ergonomics with the Control Touchscreen and E-stop now on the front of the machine for easier operator access. The reverse cut lead edge smoothly funnels its way through the punch hole in comparison to the standard cut lead edge. A great advantage especially when binding thicker books. An option on the PLASTIKOIL® New Concept Former. Retrofits also available for existing machines. The NCF6 Concept Former manufactured by Gateway Bookbinding Systems Ltd. Allows for easier mandrel changes and a better cool air flow around the forming coil. Ensures precise amount of oil is released so coil is not under lubricated or too greasy. The Hot Start Feature allows the NCF6 Concept Former to Stop and Start – without any interruptions in production. Hot air keeps the filament warm as it exits the heater drum so that when the Former re-starts there is no product distortion. A very important feature that allows the Concept QS Interline Systems to operate as well as they do.